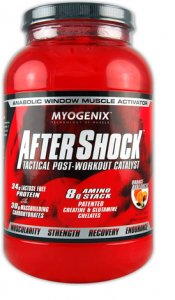 Editors Note: If you are interested in the buying aftershock recovery for the best price, we found the cheapest online source at A1 Supplements – Click here for the link to the Aftershock Recovery. When it comes to a making a high quality, muscle building recovery shake this one takes the cake. MyoGenix AfterShock Recovery contains all the ingredients needed for making a high quality product including 32 grams of protein, 30 grams of carbs, Kre-Alkalyn (my personal favorite choice of creatine), and a great BCAA profile. The last thing you want after a long workout it having to chug down protein shake that tastes like garbage. Well AfterShock Recovery is far from it. This is probably one of the best shakes I’ve had when it comes to taste. Take note I’ve only had the fruit punch and the chocolate flavors but both we’re actually enjoyable to drink. If I had to choose I would pick the chocolate over the fruit punch as it tastes a lot like an McDonald’s chocolate shake in my opinion. However if you aren’t a fan of chocolate shakes the fruit punch is a pretty good alternative. If you’ve tried any of the other flavors leave a comment and let us know what you think. Similar to the taste issue, one of the worst things about protein shakes are clumps in your shake, no one enjoys that. Aftershock recovery passed the mixabilty test with flying colors. The shake can actually be completely mixed with jump a cup and spoon and come out smooth. Personally I use a blender ball shaker cup and it works like a charm. I used Myogenix AfterShock Recovery for two months during the winter with the goal of putting on as much muscle mass as possible without added too much excess fat (essentially a clean bulk.) During these two months I gained nearly 16 pounds of mass with very little noticeable fat gain. Honestly while using AfterShock Recovery I had probably my best ever results with putting on size and strength. An increase in my one rep Bench Press max from 235 to 275 in only two months is about as good as it gets for me personally. Obviously I couldn’t keep gaining 2 pounds of muscle mass a week (104 lbs of lean mass a year, I wish) but for these two months it worked wonders. Due to that I had to give Myogenix AfterShock a perfect 5/5 rating as I couldn’t expect anything better. If you’re goal is to put on a much lean muscle mass as possible and speed up your workout gains this is definitely one of the best supplements on the market. To help you out even more you can take a look at the online price comparisons for MyoGenix After Shock below to get it for the best price possible. Micro Jack3d Review – Is it Safe – Is it Any Good?